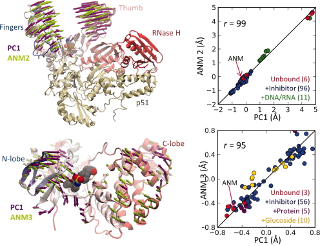 Dynamics of p38 MAP kinase inferred from a structural ensemble using PCA is compared to intrinsic dynamics of the protein modeled using ANM. 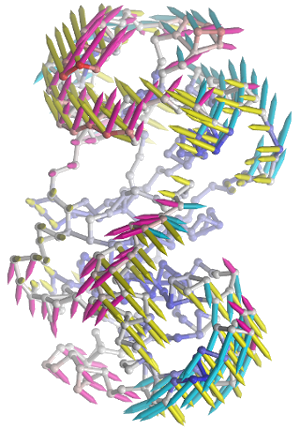 See PCA of X-ray structures or Bioinformatics article for more details. Workflow for comparative analysis of sequence evolution and structural dynamics is shown. See Evol Applications or Mol Biol Evol article for more details. 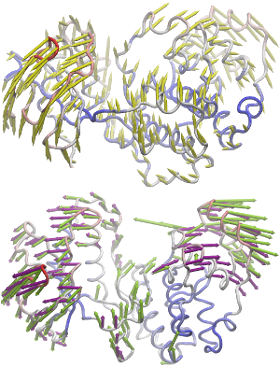 Results from comparative analysis of residue conservation, conformational mobility, and coevolutionary patterns for uracil-DNA glycosylase. See Mol Biol Evol article or Conservation and Coevolution Analysis for more details. 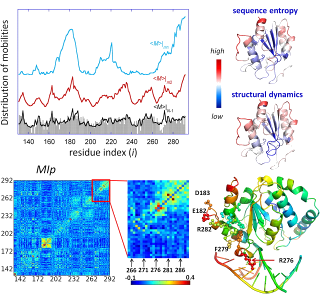 Coevolution of NEF-binding residues analzyed using mutual information is displayed for the Hsp70 ATPase domain. 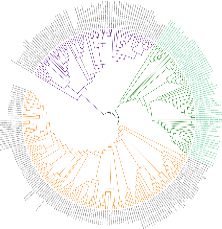 See PLoS Comp Biol article or Conservation and Coevolution Analysis for details. 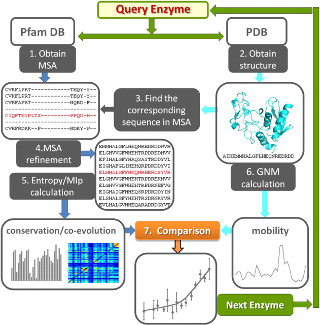 Comparative analysis of p38 MAP kinase dynamics from experiments (PCA) and theory (ANM). See the PNAS article or figure for details. 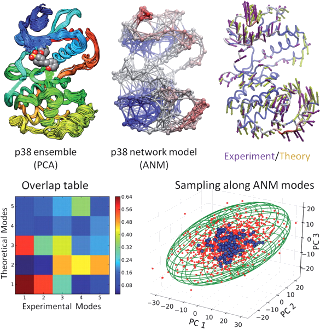 Comparative analysis of dynamics of drug target proteins and model systems from experiments (PCA) and theory (ANM). See the Protein Science article for details. Comparative analysis of p38 MAP kinase dynamics from experiments (PCA), simulations (EDA), and theory (ANM). See the Protein Science article for details. Animation shows HIV-1 reverse transcriptase functional motions calculated using anisotropic network model. Arrows and animations are generated using NMWiz VMD plugin. See NMWiz tutorial for usage examples. 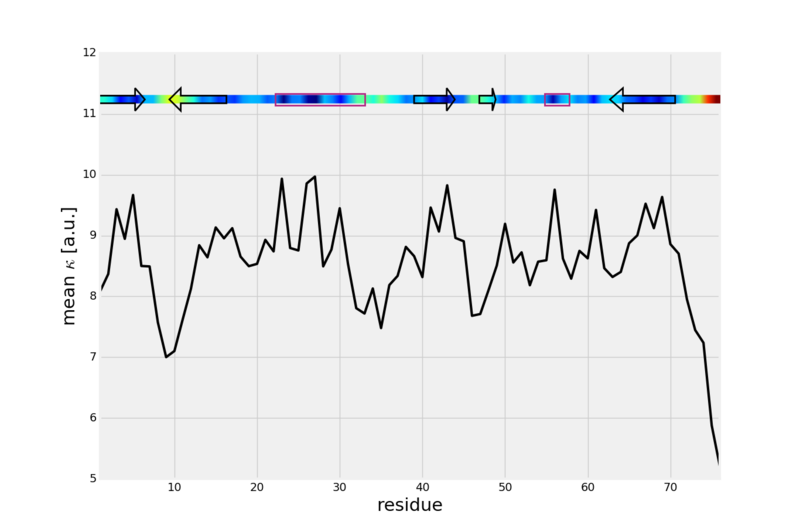 You can make a quick protein representation in interactive sessions using showProtein() function. NMWiz is designed for picturing normal modes easy. Image shows arrows from slowest three ANM modes for p38 MAP kinase centered at the origin. They indeed align with planes normal to each other. 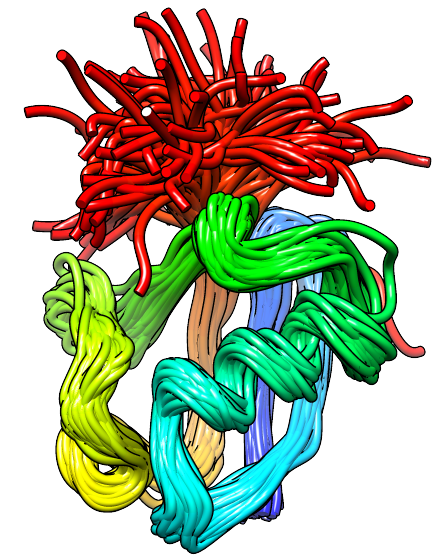 NMWiz makes depicting elastic network models and protein motions predicted with them easy. 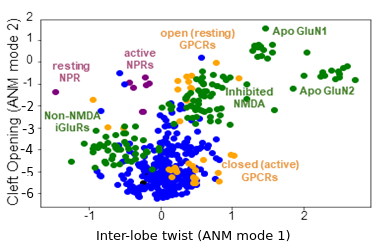 Image shows ANM model for p38 MAP kinase and three slow ANM modes (below). NMWiz can be used to comparative dynamics inferred from experimental datasets and predicted using theory. 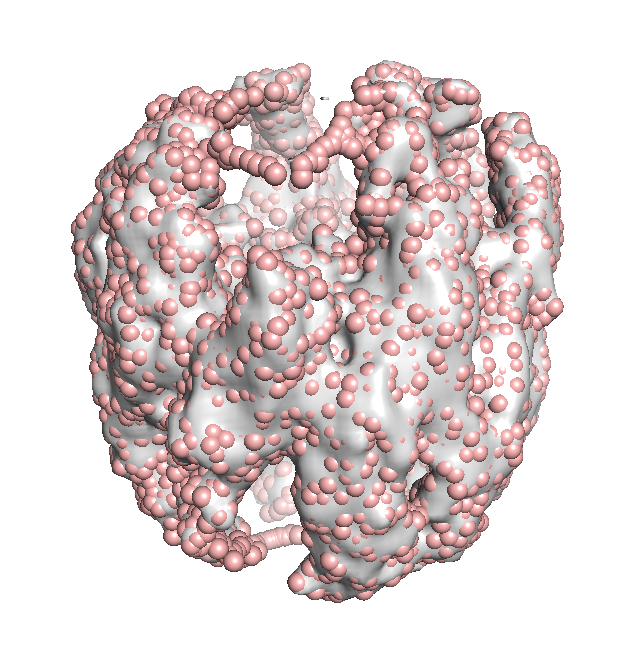 The movie shows a molecular dynamics simulation for assessing the druggability of kinesin eg5. NMWiz VMD plugin. See NMWiz tutorial for usage examples. 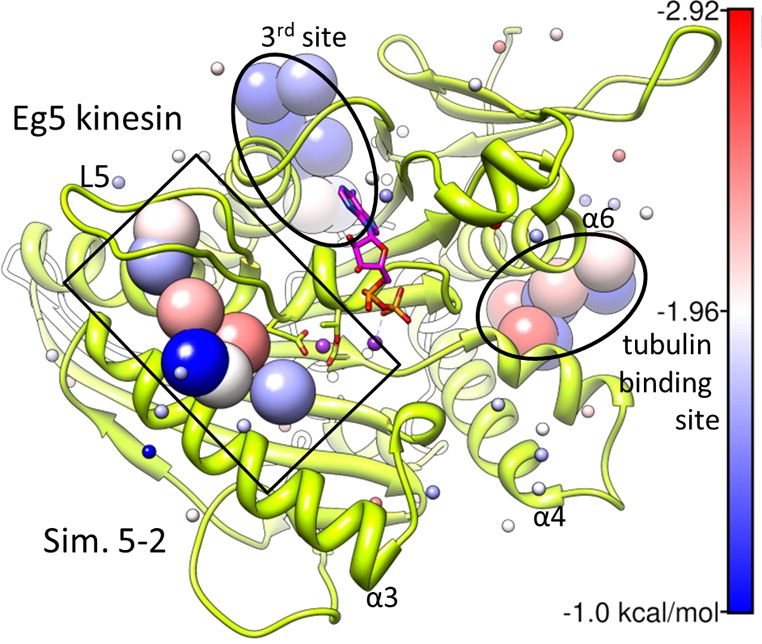 Kinesin Eg5 druggable sites, including allosteric inhibitor binding site and and tubulin binding site, identified by simulations are shown. See our publication for details. Sampling of the functional substates (inward-facing (IF) or outward-facing (OF), in closed (c) or open (o) forms) of LeuT using coMD simulations. See publication for details. 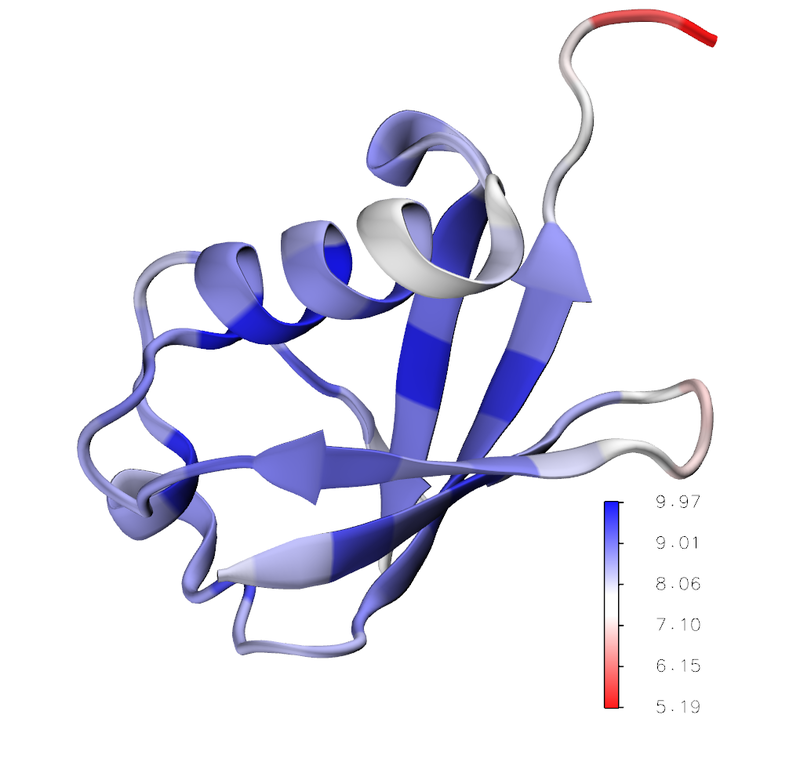 The movie illustrates a coMD trajectory for adenylate kinase. NMWiz VMD plugin. See NMWiz tutorial for usage examples. 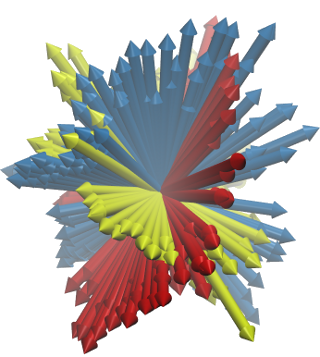 Energy landscape in the space of principal coordinates. 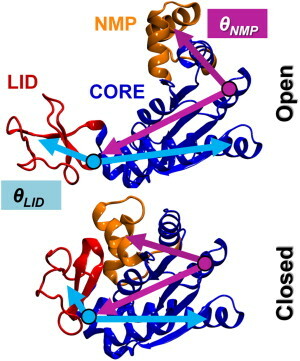 Outward-facing (OF) and inward-facing (IF) structures of GltPh show a large displacement of the core domains. See publication for details. 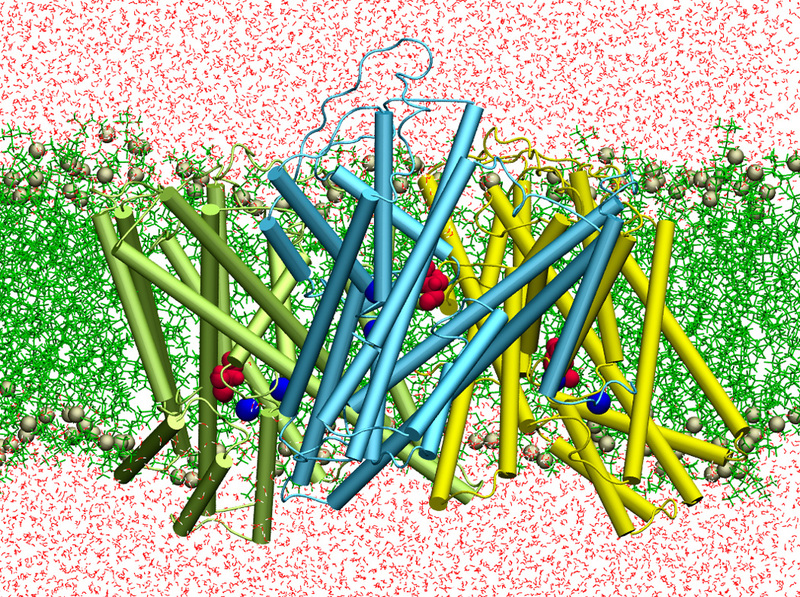 The second mode of the OF structure moves all three transport domains simultaneously through the membrane in a ‘lift-like’ motion. See publication for details. 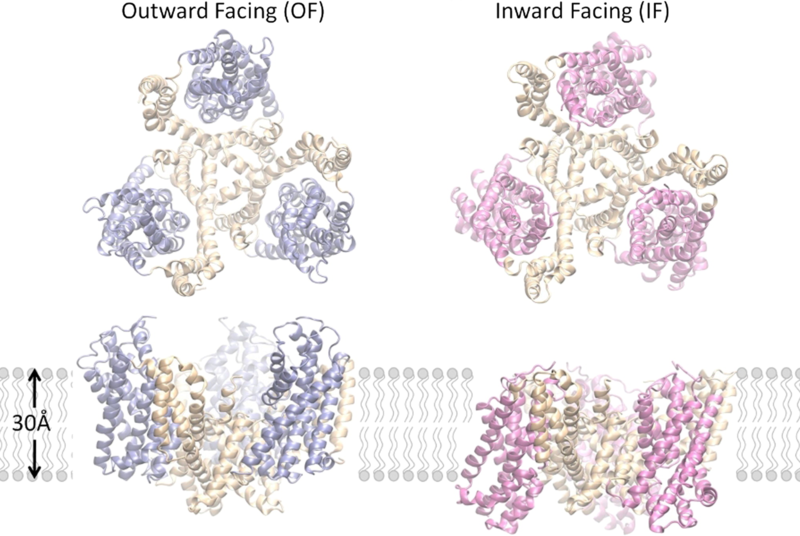 The second mode of the IF structure moves all three transport domains simultaneously through the membrane in a ‘lift-like’ motion. See publication for details. Deformability profile of ubiquitin (PDB code: 1UBI). 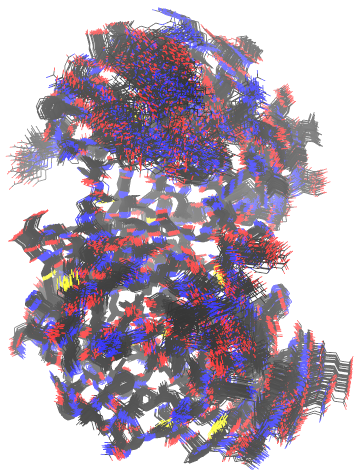 Structure is automatically uploaded to VMD program where blue color shows regions which are mechanically more resistant to the external force. 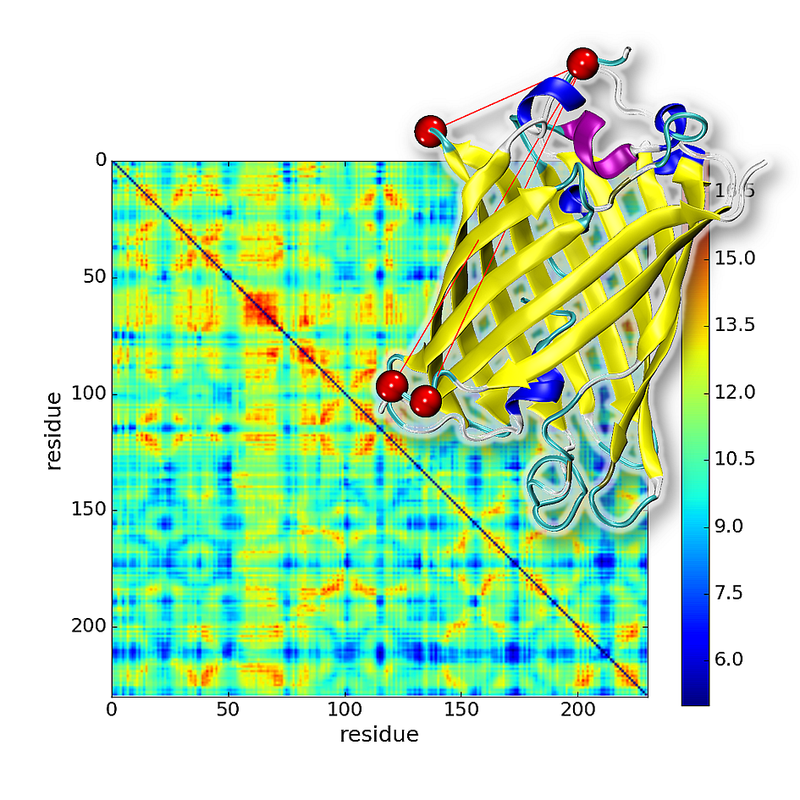 Mean value of effective spring constant (calculated from mechanical stiffness matrix) with secondary structure of ubiquitin. Blue color indicates mechanically strong regions. 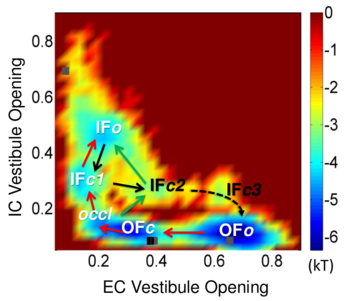 Mechanical Stiffness Map with effective force constant in a color bar (blue - strong regions, red - weak regions) for ubiquitin. Workflow for GNM analysis of chromatin dynamics. See publication for details. Covariance matrix of chromosome 17 of human B cells. Structural domains and CCDDs are identified and outlined. See publication for details. 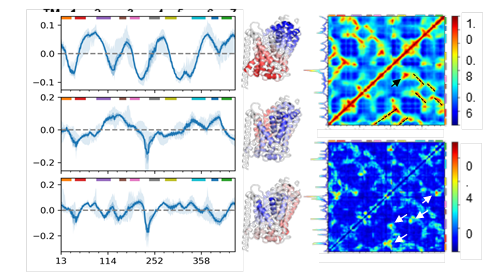 3D Laplacian embedding of chromosome 17 loci using the first three principal modes. See ChromD tutorial for details. 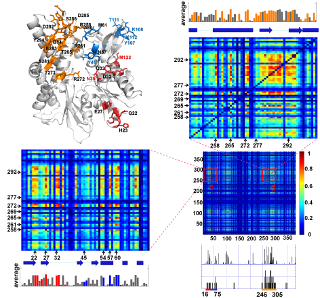 Perturbation response scanning of the Hsp70 chaperone reveals interdomain allostery. See publication for details. 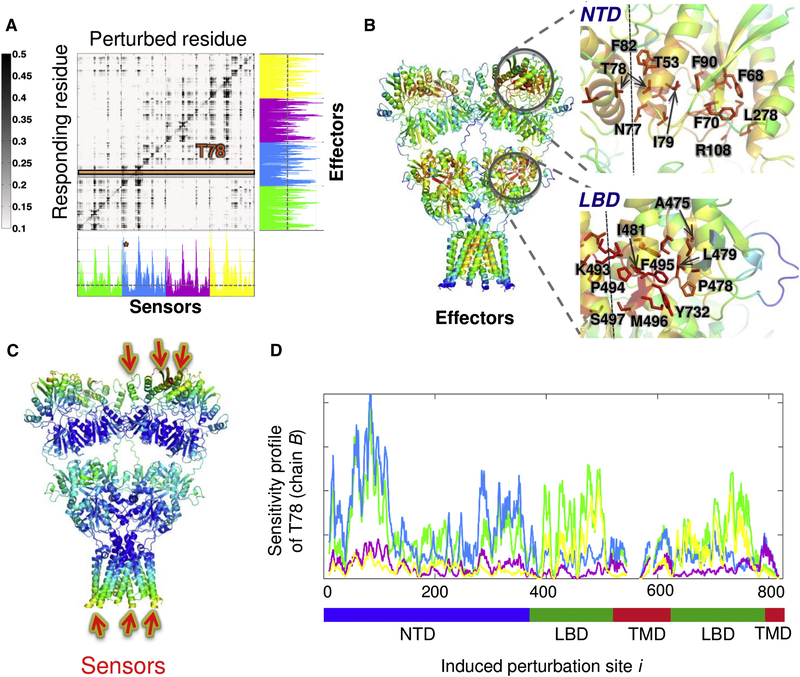 Perturbation response scanning of the AMPA-type glutamate receptor reveals sensors and effectors for allosteric signaling. See publication for details. 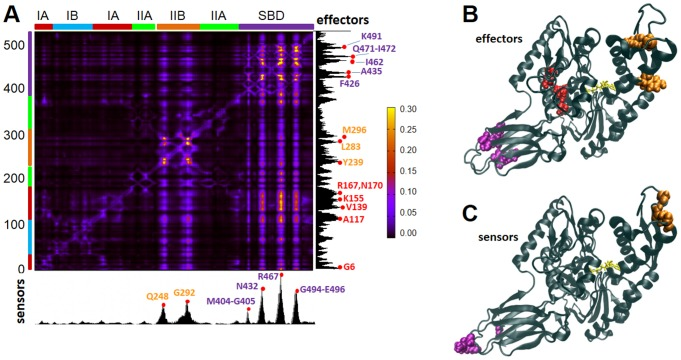 A more in-depth analysis of the PRS matrix reveals interdomain signaling in the AMPA receptor. See publication for details. 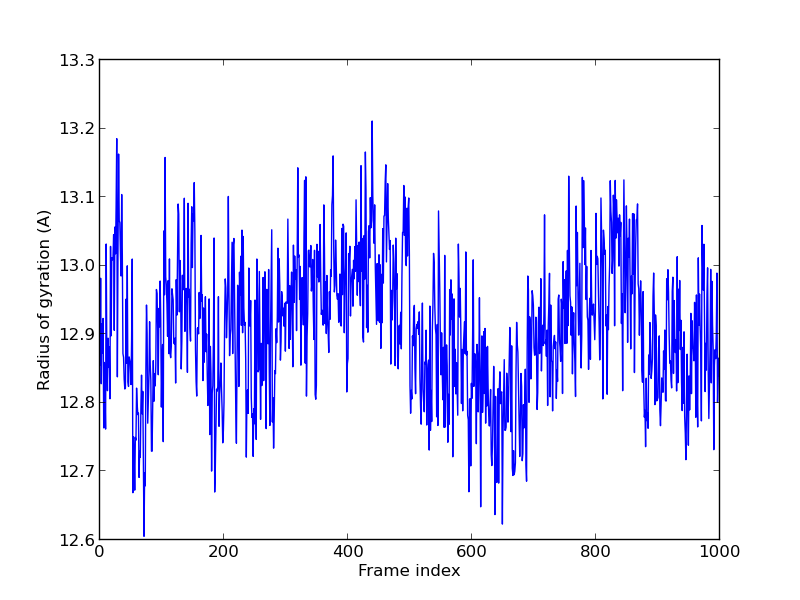 The left panels show the three softest GNM modes (blue lines) and their standard deviations (faint blue bands). Red and blue regions in the corresponding ribbon diagrams show regions moving in opposite directions. 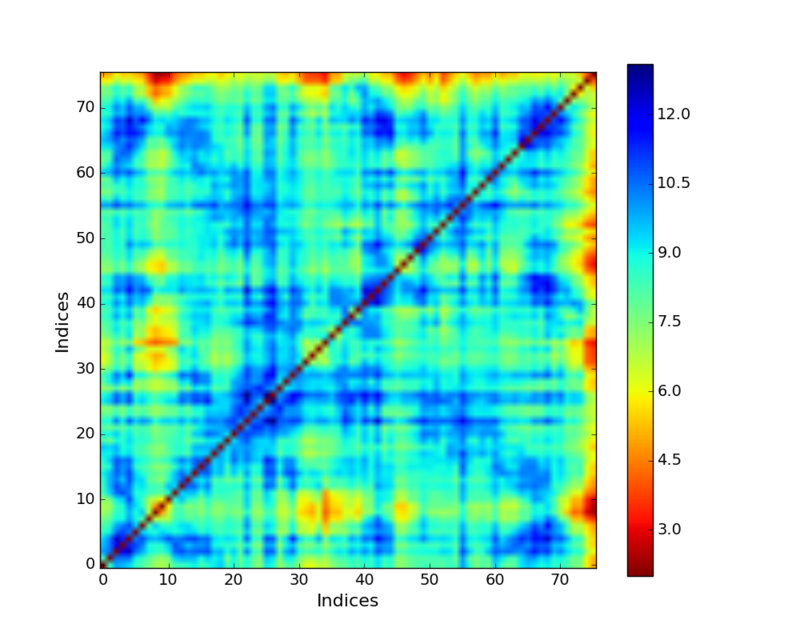 The right panel has the average cross-correlation matrix from the first 20 global modes (top) and its standard deviation (bottom). 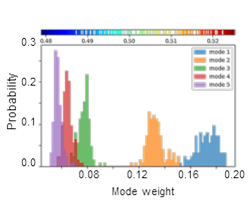 Square fluctuations calculated from the top 5 global modes are shown for a number of LeuT fold family members, revealing similarities and subfamily- or conformation-dependent differences. 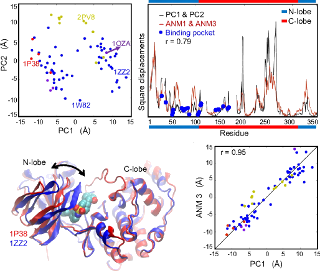 Type-I periplasmic binding protein domains are mapped onto the first two signature ANM modes. 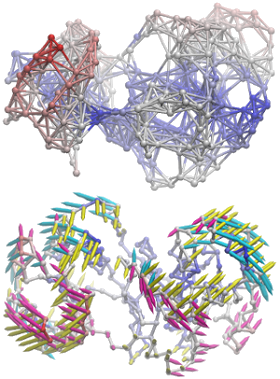 These domains, found in a range of proteins including bacterial solute carriers and eukaryotic receptors, have two lobes that undergo well-characterised conserved motions that are evident from comparison of structures. 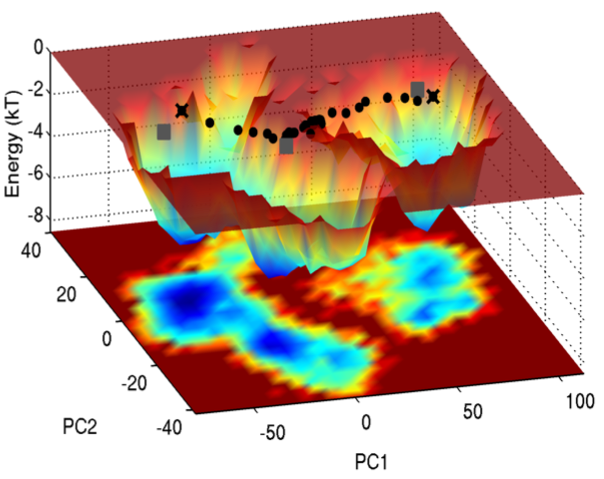 SignDy reveals such conserved dynamics. SignDy analysis allows a comparison of the frequency dispersion of family members. 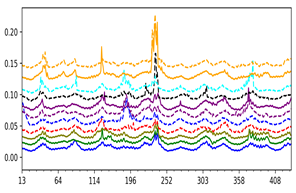 The distribution of inverse eigenvalues is shown for the softest five modes for TIM barrel fold family. The ProDy development team hosts annual workshops together with the NAMD/VMD development team as part of our joined center MMBioS funded by NIH through the P41 GM103712 award. Lectures, tutorials and other materials from previous workshops are available here. Learn how to use ProDy from the introductory ProDy tutorial or from the comprehensive API reference manual. Learn how to depict normal modes and generate animations of protein dynamics along them with NMWiz. Learn how to identify conserved and coevolved residues and characterizing their dynamical properties. Learn how to setup and analyze druggability simulations containing small organic molecules using DruGUI. Learn how to perform normal mode analysis and developing customized force constant functions. Learn how to analyze large and heterogeneous ensembles of protein structures to infer dynamical properties. Learn how to compare and align structures, identify ligand contacts, and extract ligands from PDB files. Learn how to analyze simulation trajectories, in particular handling large trajectory files that don't fit in memory. Learn how to generate alternate protein conformations along ANM modes and to refine them using NAMD. Learn how to sample transition pathways between known conformers using a multiscale hybrid methodology. 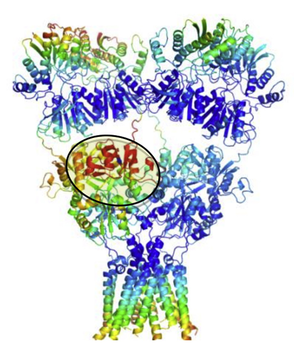 Learn how to include the effect of lipid bilayer in ENM study of membrane proteins dynamics. Learn how to evaluate signature dynamics of a protein family and classify proteins based on their dynamics. Learn how to create elastic network models from electronic density maps and use them for normal mode analysis. ProDy is developed in Bahar Lab at the University of Pittsburgh. Click here to see a list of people who contributed to its development. 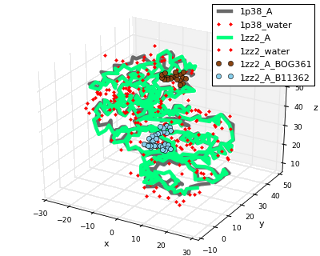 ProDy makes use of great open source software including NumPy, Pyparsing, Biopython, SciPy, and Matplotlib. Click here for details. ProDy is open source and you can contribute to its development in many ways. See this guide for getting started. Let us know any problems you might have by opening an issue at the tracker so that we can make ProDy better. © Copyright 2010-2014, University of Pittsburgh. Last updated on May 21, 2018.